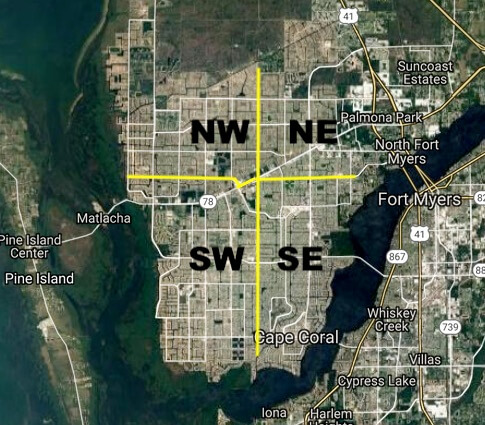 Cape Coral is divided into four quadrants (NW, NE, SW, SE). The NW/NE are divided at Santa Barbara Blvd, going east/west. The NE/SE are divided at Hancock Bridge Pkwy, going north/south. The SE/SW are divided at Santa Barbara Blvd, going east/west. The NW/SW are divided at Embers Pkwy, going north/south. I always remember the acronym ABC+P for up and down. How to find an address…. Watch for the crossing street…what we call the Block. If you are looking for 3515 Del Prado Bvd S = you drive down Del Prado and look for the cross St around 35th (called the 3500 block). If you are looking for 2817 Skyline Blvd… you drive down Skyline Blvd and look for the cross street around 28th (called the 2800 block). Hope these tips help you……………. Filed Under: Cape Coral News, Cape Deb's Blog Tagged With: Cape Coral (old), cape coral agents, cape coral homes, cape coral navigating, cape coral realtor, cape coral street, navigating cape coral, where do i find in cape coral?